A hotel managed by Meliá Cuba is once again among the winners at the 26th edition of the famous World Travel Awards. 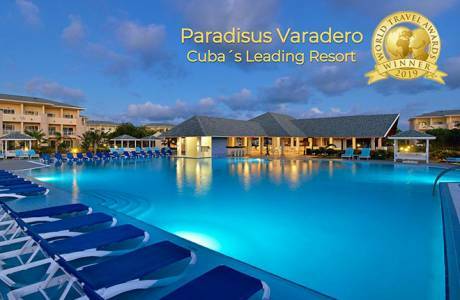 In the Cuba’s Leading Resort 2019 category, the award went to the Paradisus Varadero Resort & Spa, located in the resort of the same name, in western Cuba. The magnificent natural surroundings make Paradisus Varadero a perfect choice for business and pleasure trips alike. This luxury All Inclusive Five Star Accommodation has 806 supremely comfortable rooms, all Junior Suites and Suites, as well as options for families, swim-up spaces and two exclusive Garden Villas. The hotel is known for the unique experience provided by the highly personalised attention in the Royal Service (Adults Only) and Family Concierge (Families) areas, with special facilities and the unmistakable hallmark of exclusivity. Paradisus Varadero is ideal for weddings and honeymoons, family trips, events, conferences and trips with a focus on wellness and quality of life. Known as the “Tourism Oscars”, the World Travel Awards are the highest form of recognition in the sector. Created in 1993, today they are synonymous with excellence in all areas of the travel industry across the world.